Loss of whole blood, adult diarrhea. 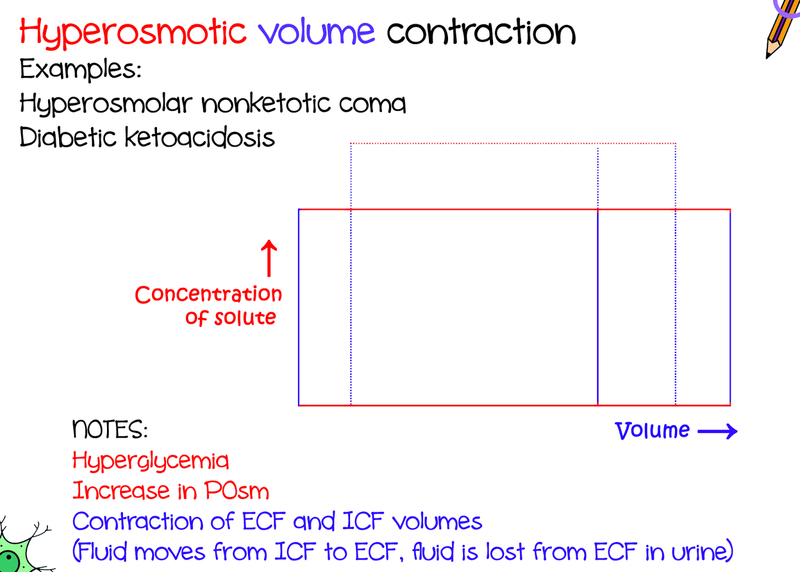 What will happen to volume in ECF compartment? 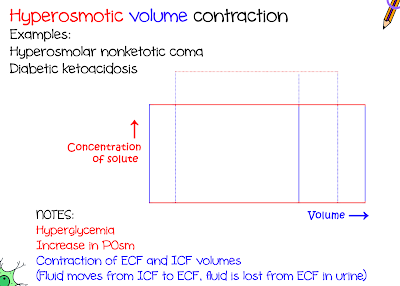 What will happen to osmolarity in ECF compartment? 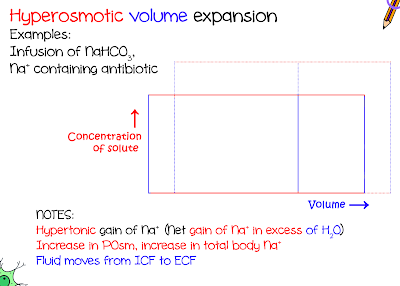 What will happen to ICF volume and osmolarity? Let's look at a similar example. Infusion of excessive isotonic saline. 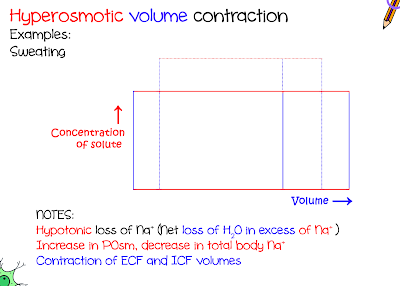 No osmotic gradient, therefore, will not change. (Loops make you lose sodium and water, but more of sodium than water. What will happen to ICF volume? (SIADH: You are conserving too much water due to ADH. So.. You're getting this, right? Let's make it tougher then! Right heart failure, Cirrhosis, Nephrotic syndrome. Can't figure why? Well.. Here's why! 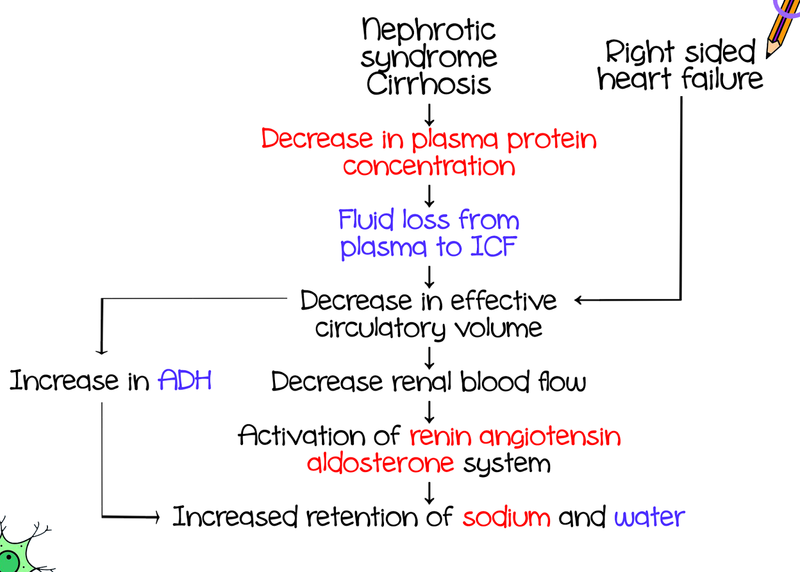 This leads to decreased renal blood flow and pressure and increased ADH secretion and activates the renin angiotensin aldosterone system, increasing sodium and water reabsorption. Note: Total body sodium is increased, however, serum sodium is decreased. Insensible water loss in fever, diabetes insipidus, alcohol. 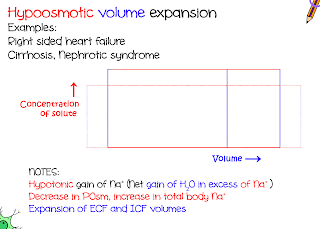 Note: The ECF contraction is mild because there has been no loss of sodium. Infusion of sodium bicarbonate, sodium containing antibiotics. Hyperosmolar nonketotic coma, diabetic ketoacidosis. 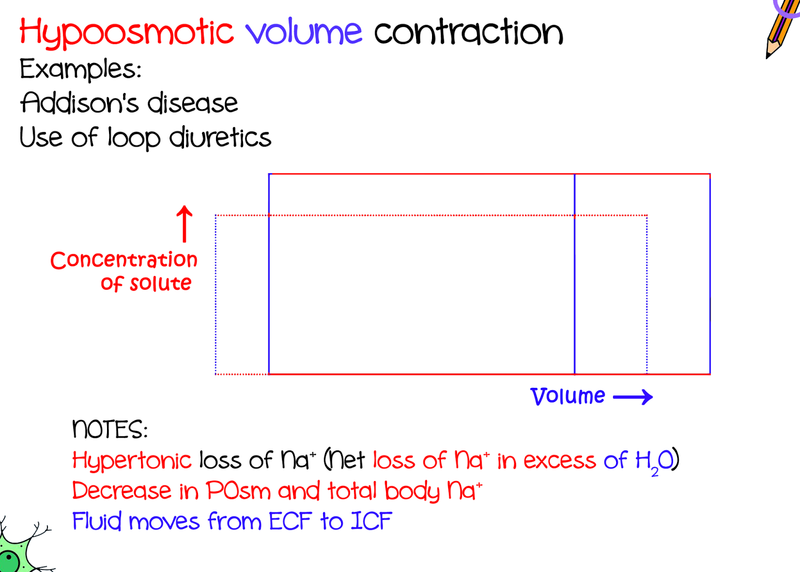 This gets a little tricky.. ^__^"
Glucose in urine acts as an osmotic diuretic and the water from ECF is lost. 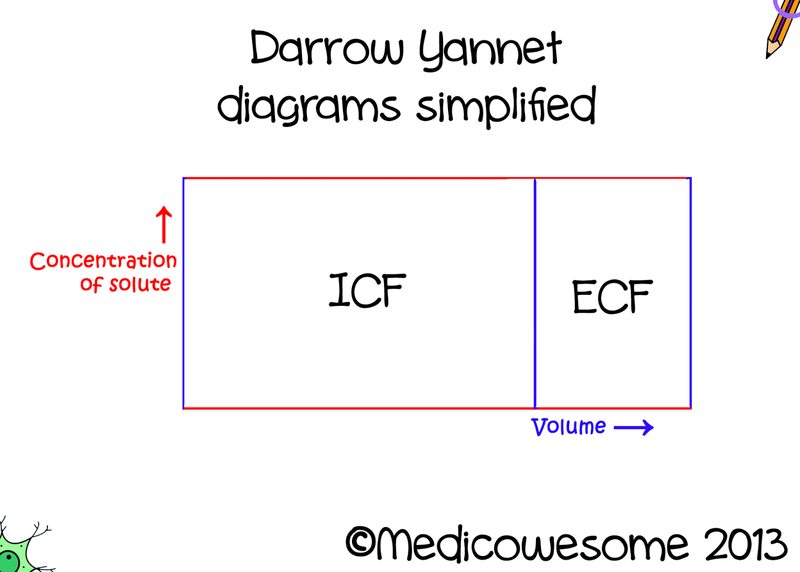 What will happen to the Darrow Yannet diagram if a person running a marathon replaces all the volume lost in sweat by drinking water? What will happen to total body volume? 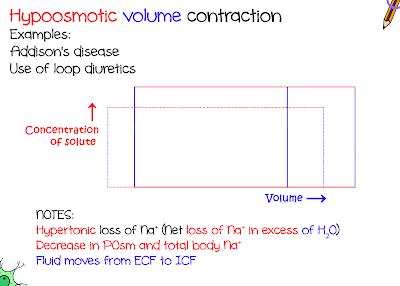 What will happen to osmolarity in ICF compartment? 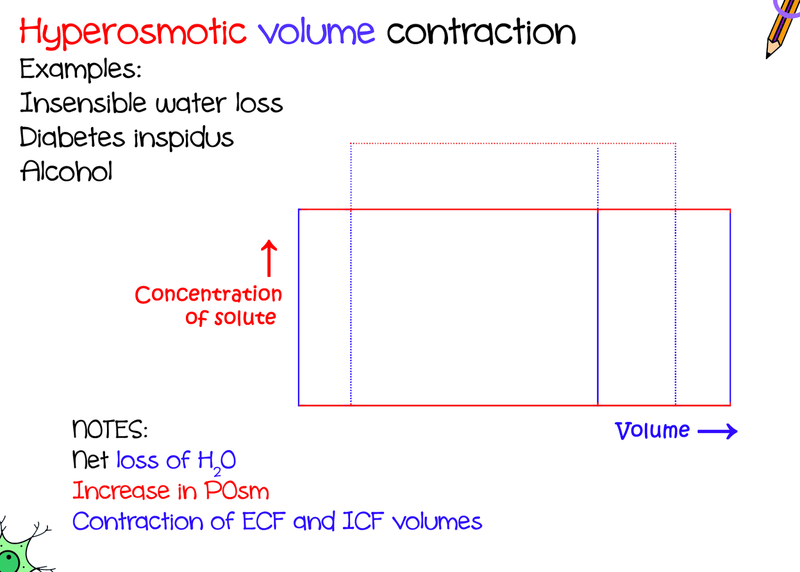 Updated on 7th January, 2014: Diagram on isoosmotic volume contraction and isoosmotic volume expansion. 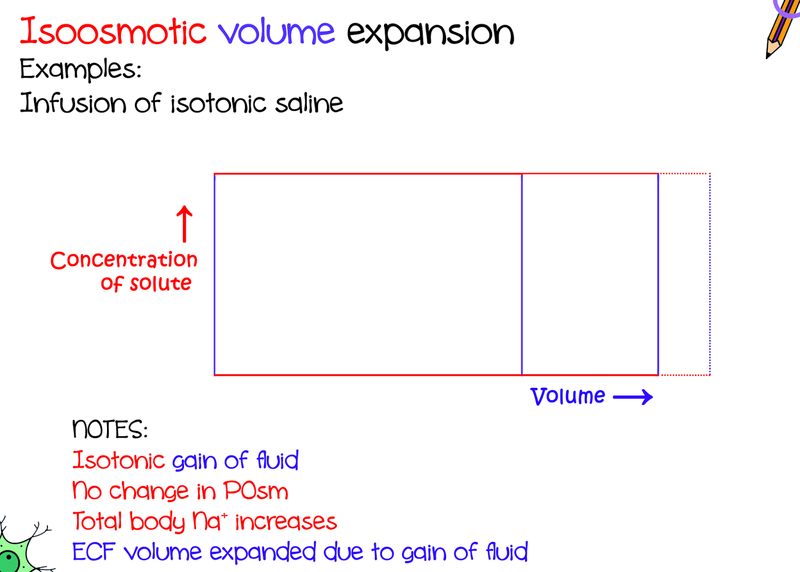 Updated on 11th September, 2014: Notes typo in infusion of excessive isotonic saline section. IkaN......Your explanation of the Darrow Yannet Diagram is amazing....The progression from the beginning till the end....it just gets absorbed into your head (unconsciously)....dats how good it is.....hats off to you !!!! 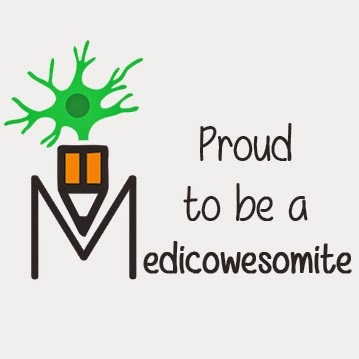 You are BRILLIANT !!!! thank you IkaN the explanation is amazing ; but i dont understand the last one. 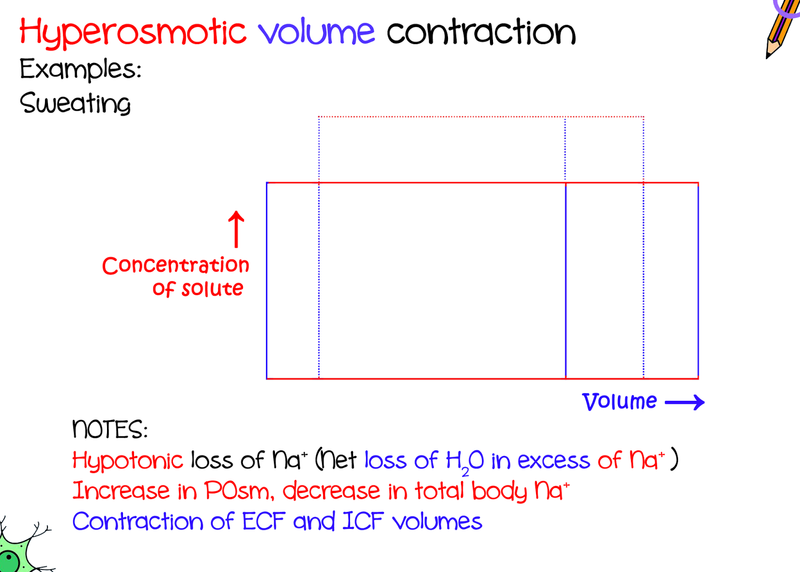 why do you call the last one as hypoosmotic volume contraction? because you said that the volume in ECF will remain the same.(Why? He replaced all the volume lost by drinking water!). 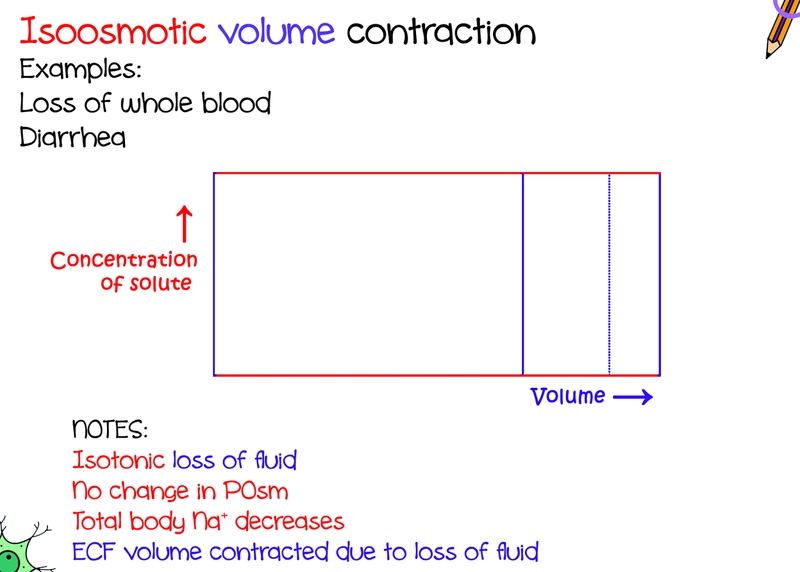 i dont understand why you said volume contraction rather than remaining volume the same. We say volume contraction because we always talk in reference to ECF. He did replace the water but it got shifted to the ICF. 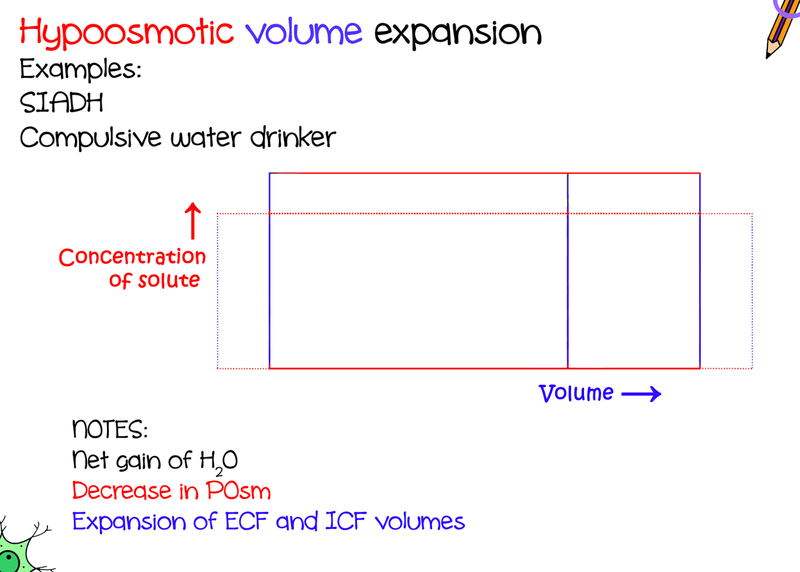 So though the total body water is the same, the ECF volume has contracted. thank you IkaN for your quick response. I think my problem is that the answer of the question stated that "Will remain the same" . 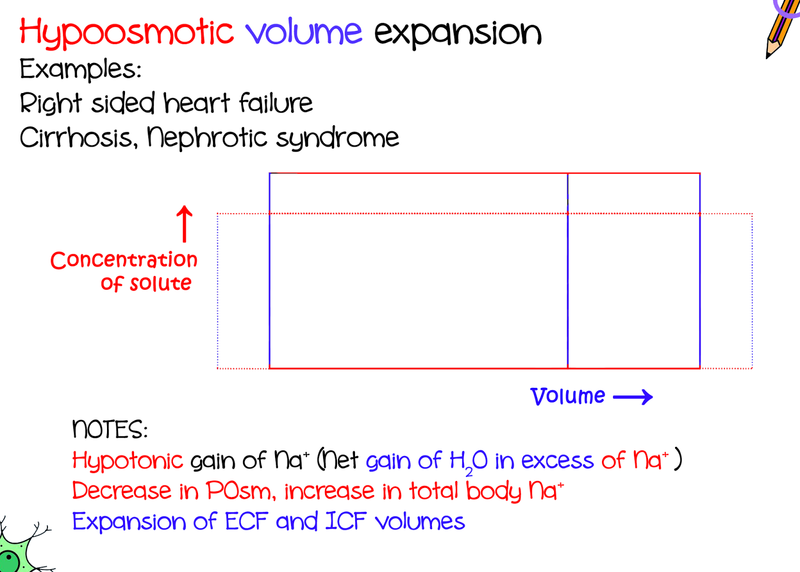 What will happen to volume in ECF compartment? Will remain the same. (Why? He replaced all the volume lost by drinking water!) but you just answer in your response that "ECF volume has contracted". Am I missing anything here? on the other hand I would like to ask about (i)isoosmotic volume contraction and (ii) isoosmotic volume expansion. why the total body Na doesn't change in given two situations (i,ii) ? The total body Na+ does change. I typed it wrong over there. Haha yes, why be discouraged? What's the point in being in medicine if you can not admit your mistakes and change accordingly? Perfect explanation... Thanks a lot !! Great, simple and clear explanations. Thanks for the great step by step explanation it makes everything much more clear!! I just dont quite understand though why diarrhea is isotonic? Gatorade is isotonic to plasma. Darrow Yannet diagram for a person on Gatorade will similar to isoosmotic volume expansion & for a person on pure water will be similar to that of hypoosmotic volume expansion. Pure water lowers the osmotic pressure of the plasma and inhibits ADH release. Person on pure water will pee more. Heyy you are most welcome! So i have a question......can albumin cross the capillary membrane? I tried searching this up but i can't figure it out!! If you know and could cite a source plz do lemme know! I know that a small amount of plasma proteins can leak out of the capillaries and into the interstitium. BUT does this include albumin? Also, there is oncotic pressure in the interstitium, so can oncotic pressure be exerted by plasma proteins OTHER than albumin too? Whether albumin can or can not cross the capillary membrane depends on which organ you are talking about. If it's the capillaries in the kidneys - it absolutely does not cross the membrane. Only in diseases like minimal change disease does albumin cross glomerular basement membrane. In pulmonary microcirculation, the interstitial oncotic pressure is high indicating significant leak of protein (mostly albumin) across the thin capillary walls under normal circumstances. So as a generalization, I would like to say albumin does not cross the capillary membranes. However, this is not absolute. Oncotic pressure is definitely exerted by other plasma proteins. Another protein that exerts oncotic pressure is α-Fetoprotein. Source: Ganongs textbook of medical physiology. I'm glad I discovered this page! I loved the explanation and understood very good, and I had fun because everything is so friendful. This looks amazing i understand how it works however I have a question, if you add mannitol 20% how would the diagram change since it a diuretic? and what if you add glucose 5% would that be considered as a diuretic too? 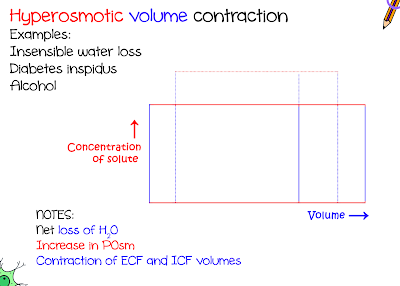 I think it would look similar to hyperosmotic volume contraction since water is lost. I'm not sure though. Ok my teachers are awesome nephrologists and you explained this way better than them. Thanks! Omg that's like the best compliment ever. Thank you! 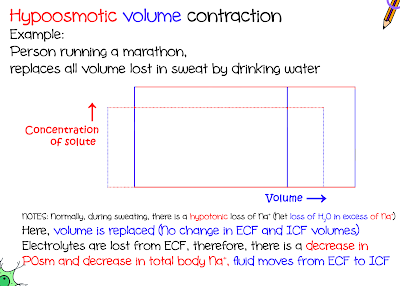 But, as you mentioned before sweating only cause lose of hypotonic fluid, is this means loss of water only? Or including salt? 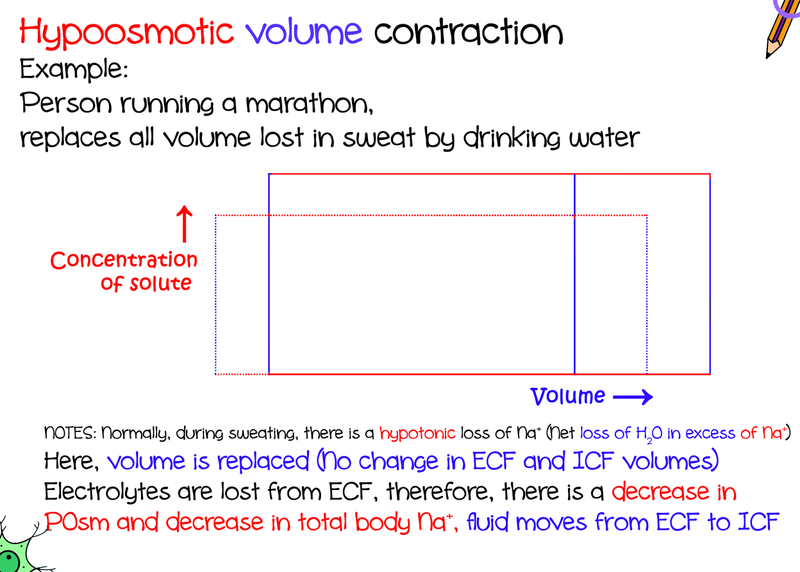 Because i was wondering sweating only cause loss of hypotonic fluid, how does it leads to losing in salts. Thanks So much! 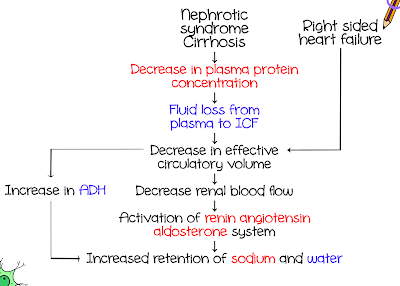 So in hypotonic fluid loss - salt and water, both, are lost.